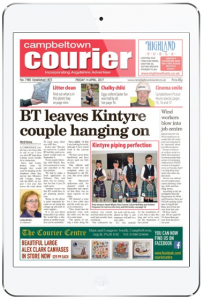 If you are a subscriber to the Campbeltown Courier Wesbite you get access to e-editions of each weeks newspaper that matches your subscription powered by Pocketmags. This allows you to view an electronic version of the printed paper on your PC or MAC . If you have a tablet it also allows you to download the Campbeltown Courier App from your “appstore” and read on these devices. If you have activated your e-edition (You will have got an email when you bought your web access) and know your username and password Click here to log in.